The small string ensembles of the Chamber Strings I Collection present themselves as a full instrumental body rich in nuances. 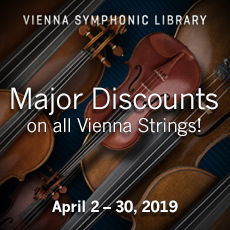 Tender or expressive, quiet or dynamic, light as a feather or energetic – with the help of the Vienna Instruments engine’s performance algorithms the ensembles’ liveliness magically unfolds when you play. The Chamber Strings I exude their flair for intimate arrangements in chamber music compositions or in divided string groups. Large string ensembles combined with the Chamber Strings I are enhanced by additional nuances and a wealth of variations. In addition to the basic articulations such as legato, portamento legato, détaché, spiccato and the repetition performances this Vienna Instrument offers many rare gems such as “zigane” portamentos, articulations with harsh attacks, harmonics, marcato performances, a wealth of repetitions, and many others.